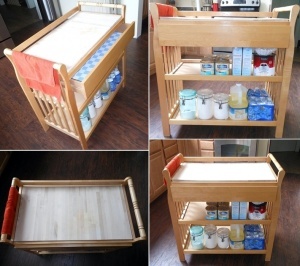 Cori Amelsberg at Pinterest has created a wonderful cutting board table from an old change table that also offers some storage for food cans and jars. 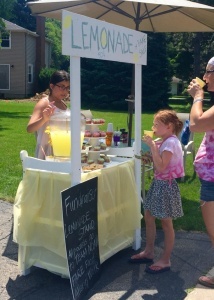 Summer is here and who doesn’t love to have a glass of fresh lemonade to beat the heat? 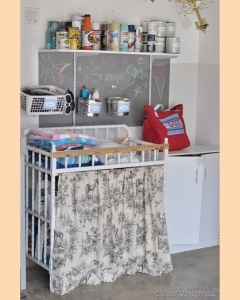 Michelle van der Linden at Pinterest too has shared a wonderful lemonade stand idea that is made from a recycled change table. 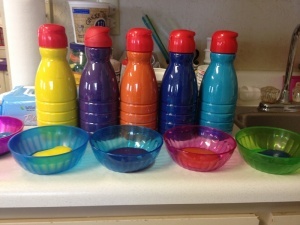 Holly at Sister’s Suitcase Blog has shared a wonderful idea to keep the little ones busy indoor while there is too much heat for your kids to go outside. 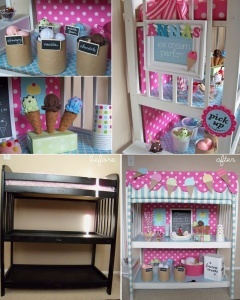 She has transformed an old change table into an ice cream parlor for her little girl. 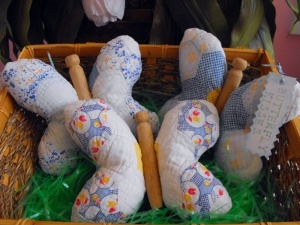 She has lined the table with fabrics in cute prints and also has created an awning. To fill the inside of the ice cream stand she has made most of the stuff from felt. Simply adorable, isn’t it? If you often need a table for doing mini tasks on your laptop then it is always a great idea to set up a small space dedicated for work. 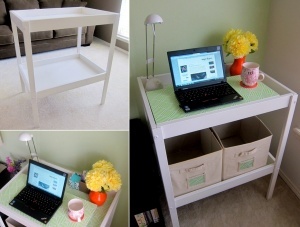 Weiya at Enjoyer of Grace came up with a wonderful idea of converting an IKEA change table into a mini workstation. Two thumbs up Weiya! 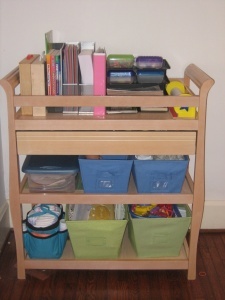 Tamra Shurgin aka The Frugal Mom had a change table of her baby girl who had outgrown the table so she used the same for storing the craft supplies of her kiddos. Little Bit of Paint Blog and The 2 Seasons Blog have transformed two old and ugly change tables into two wonderful and awesome potting benches. 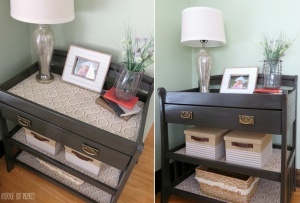 Bre at Average Inspired painted a change table in a wonderful shade of gray. Then she lined the shelves with a classy print of fabric and now you can see how a change table has gone from drab to fab. 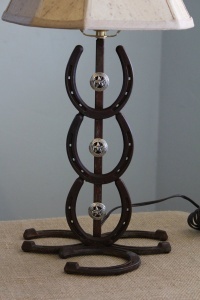 This can be a great addition to your entryway or living room as it can display a few trinkets and provides storage too. Giustina at Domestically Blissful found an old coat rack shelf and she gave it a lovely makeover with white paint and covered the pegs with glass insulators. 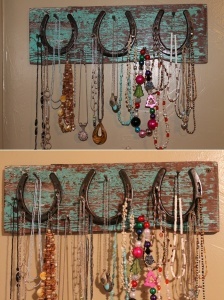 This coat rack would be a perfect vintage addition to any home. 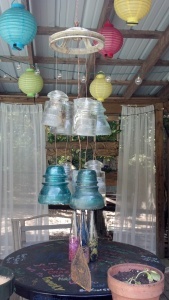 Jennifer Hempfling at Pinterest has shared an outdoor creation where a wind chime is crafted using glass insulators. 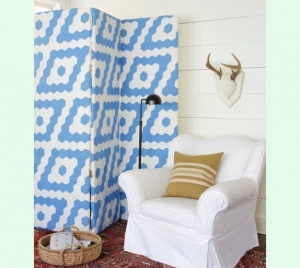 Blayr Barnard at Pinterest has shared a wonderful idea for a little boy’s room. 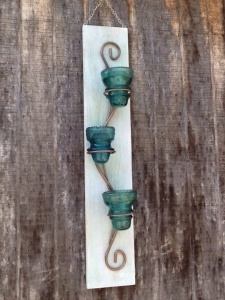 With the use of barn wood and glass insulators this cute train electric pole is created to decorate the wall. 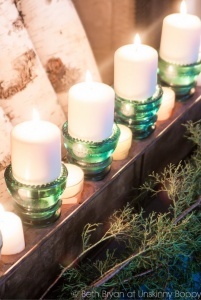 Beth at Unskinny Boppy has created a wonderful holiday decor and one highlight of this decor is the filling of fireplace with candles that are having glass insulators as their holders. Etsy Shop Green Stamp Baby has created a distressed wood tealight holder by using a metal scroll attached to a wood slab and filled with vintage glass insulators . Laurie at Vin’yet etc has come up with a clever idea. 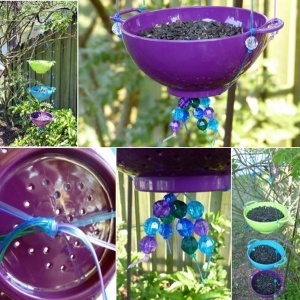 She has combined glass insulator with twine to create this awesome bird feeder for her garden. 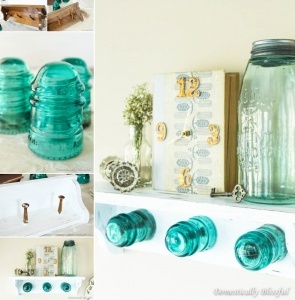 Shannon of A Southern Belle with Northern Roots has used a vintage glass insulator to store ear buds in her bathroom. That sounds cool, isn’t it? 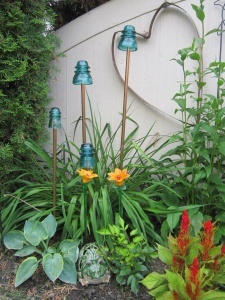 The Garden Glove has shared a photo of garden art where glass insulators are perched over copper pipes to mimic blooms. 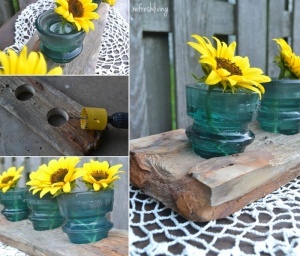 Jenny at Refresh Living combined a piece of weathered dock wood with vintage glass insulators and the result is a lovely centerpiece that you can fill with fresh flowers from your garden. 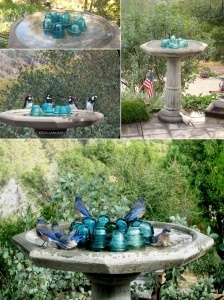 Sue Langley at Sierra Foothill Garden has shared a picture of a birdbath that has got its beauty increased by many folds by placing blue vintage glass insulators in the center. 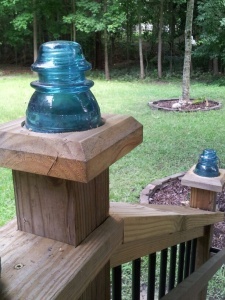 The insulators look absolutely beautiful surrounded by water. 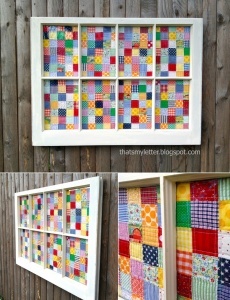 Jaime Costiglio at That’s My Letter has created a wonderful display by framing a quilt inside a window frame. 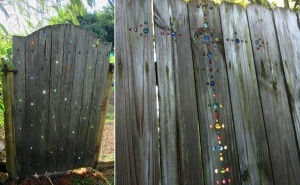 If you want to introduce a punch of color to your home, then this idea is worth giving a try to. 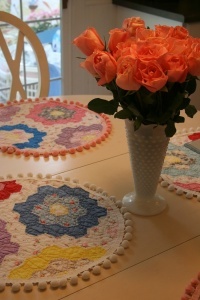 Renee of Sewn with Grace cut circles out of old quilts and then she sewed a pom pom trim along the edges and these lovely placemats came into existence. 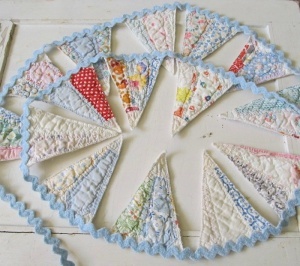 Etsy Shop Sugar And Spice has created a bunting garland by cutting triangles of an old quilt combined with rick rack trim. Elle Lilly at Etsy has created these super cute butterflies with old quilts and vintage wooden clothespins that you can use as a decor in your home. 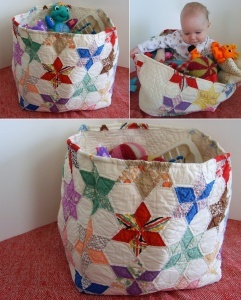 Marsha Lawson at Pinterest has a great idea for those who regularly sew. 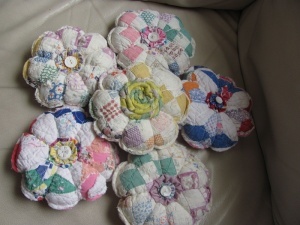 If you are in need of some pincushions then you can recycle an old quilt and create pincushions like these floral ones from the quilt in no time. 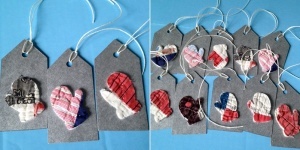 Rescued Fabrics via Etsy has created these cute as button gift tags by pasting tiny mittens cut from quilts on card stock tags. 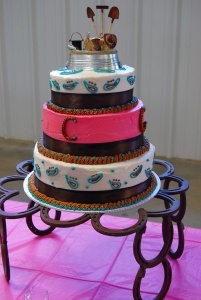 This is a great idea for making your gift a bit extra special. 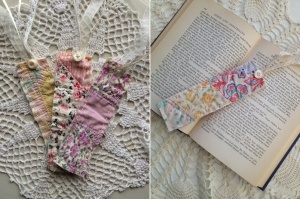 Itty Bitty Cottage has created these lovely bookmarks from pieces of old quilts, buttons and ribbons. Any book lover would simply love to have something like this. If settling for ordinary is a no for you then this headboard idea by All People Quilt is surely going to be loved by you. 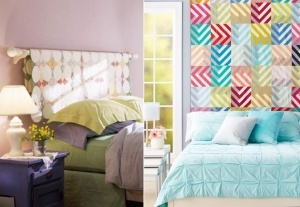 Instead of going for an ordinary headboard why not make one with an old quilt? Interesting right? 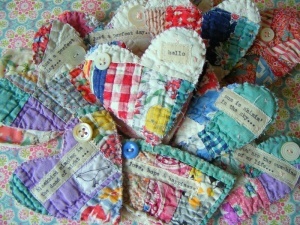 All People Quilt has shared another wonderful old quilt project. 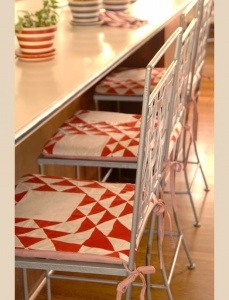 If some chairs in your home are in need of a cushion then you can go for creating a set of cushions with an old quilt. 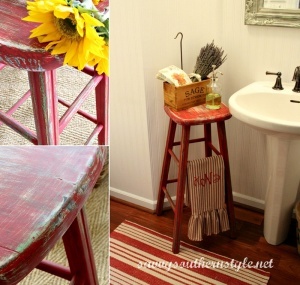 Sarah at Sadie Seasongoods painted an old and broken bar stool in a fresh coat of turquoise paint and then inverted it. 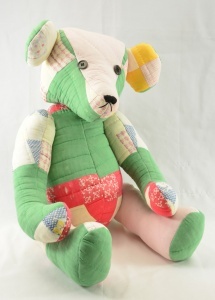 She added fabric pockets to it and wheels at its base to make it easily movable. 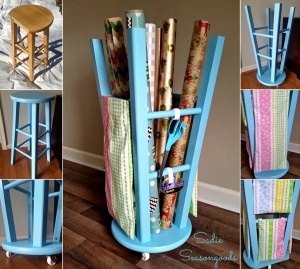 Now that old bar stool serves as a gift wrapping station. Two thumbs up Sarah! Christie at Two Broke Views when moved to a new house found two abandoned bar stools left by the previous owner of the house. An idea came to her mind. 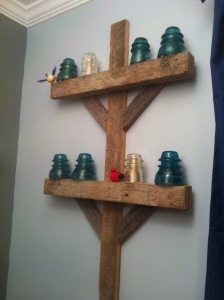 She painted them white and added twine to become the shelves in them. 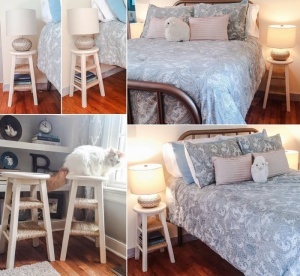 Then she placed the stools at the sides of her bed and now they serve as nightstands. 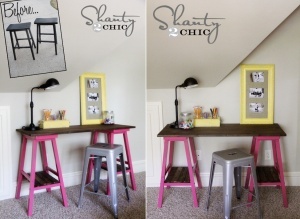 Whitney at Shanty 2 Chic painted two old bar stools in a fresh berry pink color and then added wooden plank shelves to them. 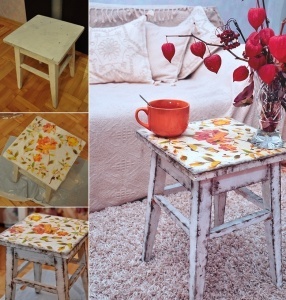 After that she topped them with a slab of wood and now they have become a wonderful table that her kids can use for doing their work and activities. 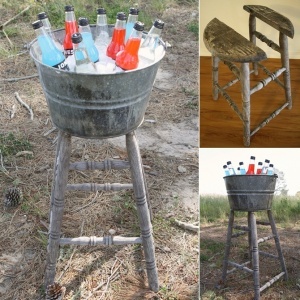 Courtney at A Diamond in the Stuff combined an old bar stool with a re-purposed galvanized bucket and a drink stand came into existence. 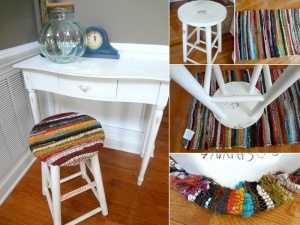 Artsy Emmy the Crafter has given an old bar stool a very unique and interesting makeover. 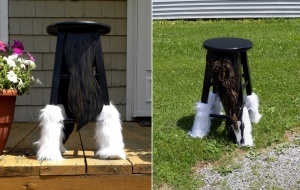 By painting the stool and combining it with accents like faux hair, wood horse head and a tail she has given the stool a look of a grazing horse. 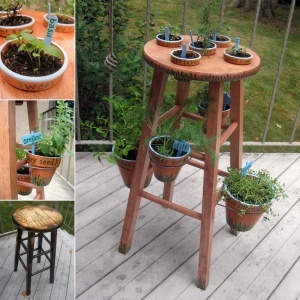 Forms of Letters Blog has shared a way to make your very own little herb garden with a bar stool. They drilled holes in the top of the stool for putting mini planters of herbs in it and then also hung a bit bigger herb pots using metal wire. 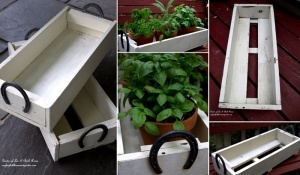 This herb garden is great for small homes and apartments where a proper garden space isn’t available. 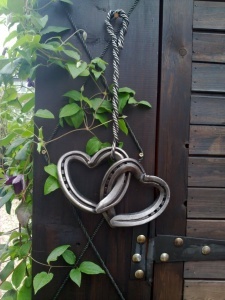 Out of Fire has created this beauteous interlocked heart art by welding horseshoes. 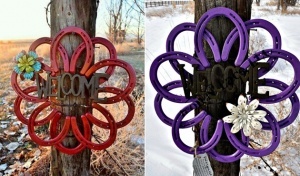 Iron n’ Lace Etsy Shop which specializes in horseshoe artwork has created these two lovely welcome wreaths in red and purple color. 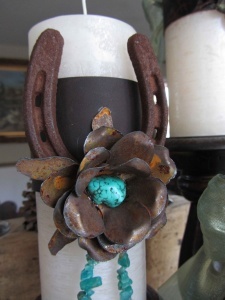 A Southern Girl Shop has welded together horseshoes accented with concho stars to create a lamp base. 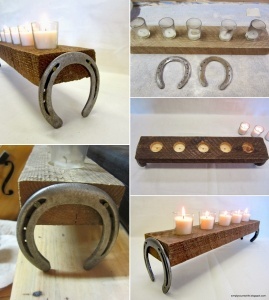 Bridget at Babblings and More has created this amazing necklace organizer by combining three old horseshoes with reclaimed wood. 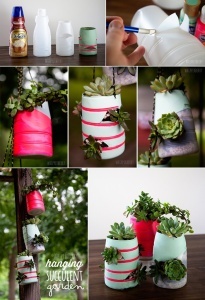 Ashley Trimble at Pinterest has created a project ideal for a garden. 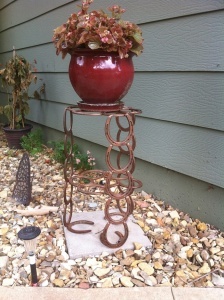 She has welded horseshoes into a cool planter stand that can serve as an amazing garden accent. 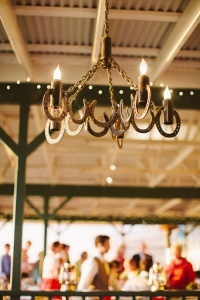 Style Me Pretty Blog has shared the pictures of a ranch wedding where a chandelier is created from horseshoes just according to the ranch theme. 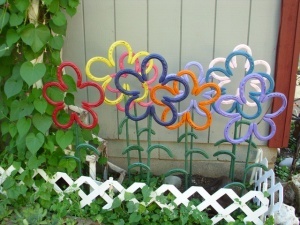 Jim Buckbee at Hometalk wanted an idea for such garden flowers that the deer could not damage and thus he welded painted horseshoes into these cute flowers. 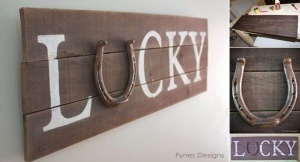 Virginia at Fynes Designs created this pallet sign that says lucky with the U made up of a horseshoe for St. Patrick’s Day. 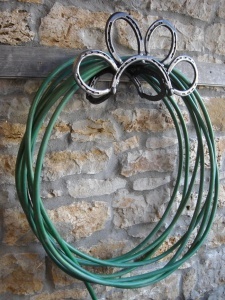 Art in Iron has created a garden hose holder with horseshoes in the shape of a flower by making a clever use of the U shape of the horseshoes. 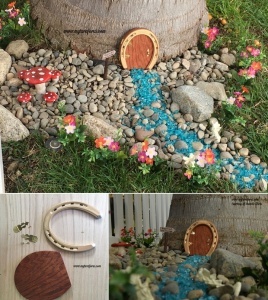 Evelyn at My Turn for Us wanted to turn a stump into a fairy house so she combined a gold painted horseshoe with some wood and mini door hardware to create a fairy house door on the stump. 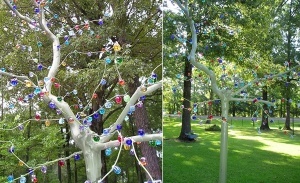 Then she decorated around the tree too to make a perfect entrance to the fairy house. 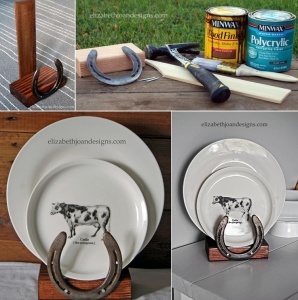 Barb at Our Fairfield Home and Garden has created a herb box from reclaimed wood and she used horseshoes as handles for the box. Tuula at Thrifty Rebel Vintage has combined three vintage cheese graters using metal wire and have added a tealight holder at the base. 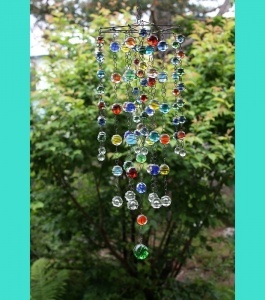 To hang it she has added metal chains and for making it yet more pretty she has added vintage glass chandelier crystals at the base. Diane at Turning Clock Back spray painted a freestanding cheese grater in a beautiful powder blue color and painted the handle of the greater in white. Then she added an embellishment of flowers at the top. 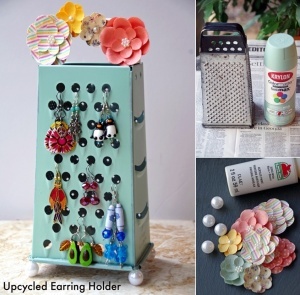 To make it look even more lovely she hot glued pearls at the bottom four corners of the grater and a cute earring holder came into existence. 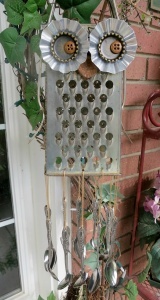 Shirley Hatfield at Pinterest has shared a wind chime that is created in the form of an owl using small jello molds, a cheese grater and a wooden and metal spoons. Etsy Shop Timeless N Chic has shared an idea of making a memo board. 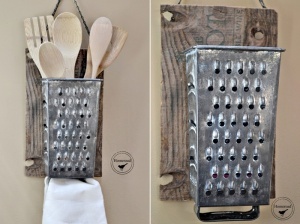 They have combined three cheese graters by tying them with jute twine. 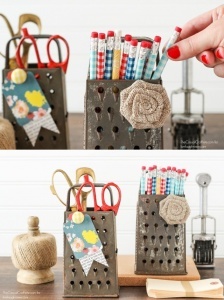 This cheese grater memo board can also stick magnets easily. 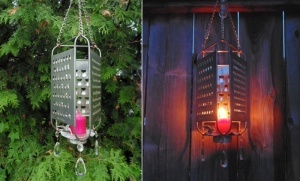 Etsy Shop Benclif Designs has transformed old freestanding cheese graters into amazing pendants lamps. 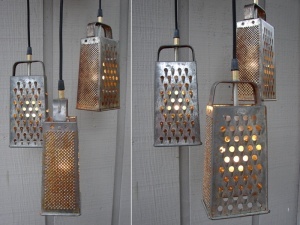 To make these you have to drill a hole in the handle of the grater and then pass the lamp’s wire and hardware through it and voila! 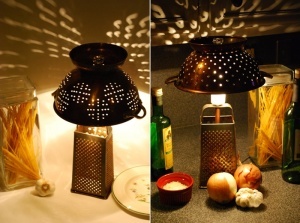 Etsy Shop Litfora Queen has combined a cheese grater with an old colander and has created a rustic table lamp that you can place even in your kitchen or dining room to make a decor statement. 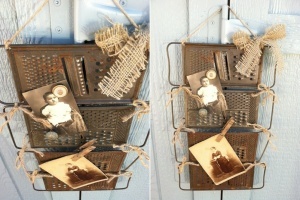 Thrifty Rebel Vintage Blog has re-thinked a colander into a two in one decor for garden. They have planted the colander with flowers and have added recycled spoons at the bottom so as it serves as a wind chime too. That’s pretty clever! 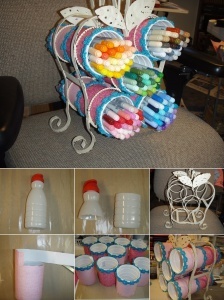 Ruffled Blog has shared the pictures of an eco friendly wedding whose theme was around decor with recycled stuff. 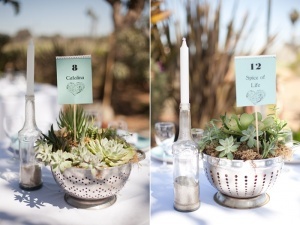 Among other recycled objects, for centerpieces colanders with succulents were used. 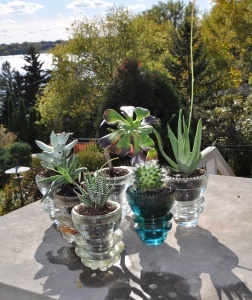 Birds and Blooms blog has shared a way to upcycle mini colanders. 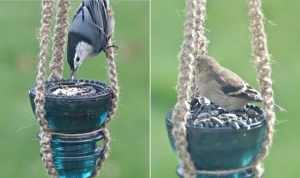 You can make bird feeders with them and can enjoy the views of cute birds coming and feeding on seeds throughout the day. A Beautiful Mess Blog has shared a way to store your yarn. 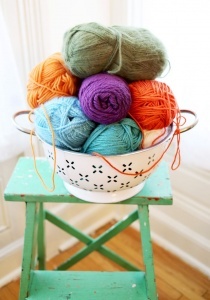 Simply put all the colors of your yarn in a colander and voila! If you want for ease you can also pass the free ends of yarn through the holes of the colander. 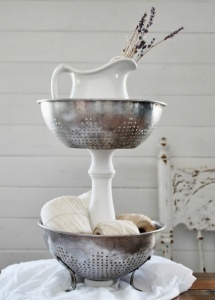 Angie at Knick of Time has combined two old colanders with a white spindle and the result is a beautiful two tiered stand that you can use for multiple purposes inside or outside your kitchen. 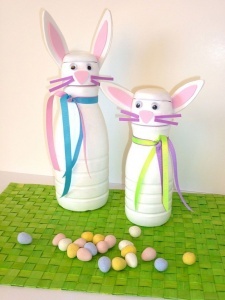 Easter is on its way and this candy container idea by Makezine blog is surely a worth trying project this Easter for kids. Wendy Pickett at Pinterest and Stockpiling Moms Blog have shared a wonderful way to get your pantry organized. 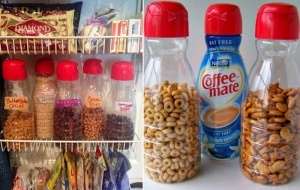 Simply upcycle empty creamer bottles into containers for storing stuff like cereals and snacks. 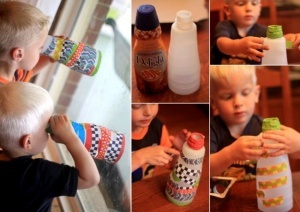 Jamie at Hands on As We Grow has shared a telescope idea that she made with the help of her little boys who decoupaged creamer bottles with tapes. 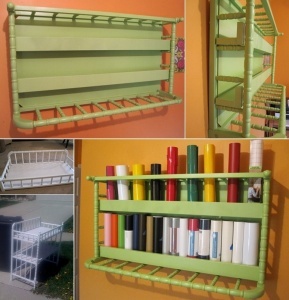 Susanne Seaton at Pinterest has shared a paint storage idea for those who have kids fond of painting or they themselves use paints a lot. 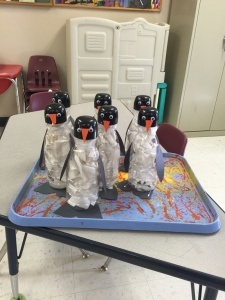 You can create mess free paint containers with creamer bottles. 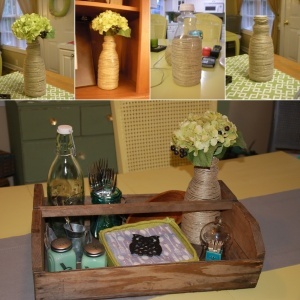 Katie at Thrifty Finds & Redesigns has created a stunningly beautiful vase by covering a creamer bottle in jute twine. 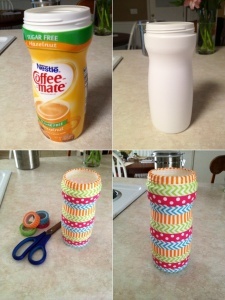 All you need to do is to hot glue one end of jute twine to the bottom of a creamer bottle. 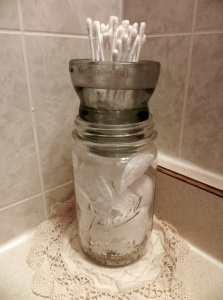 Then start wrapping it around the bottle and as you cover a height of almost an inch or half, hot glue the twine so that it may not slide off. 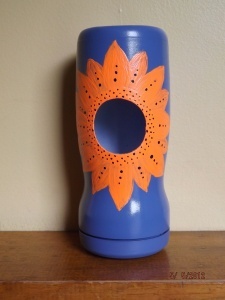 Dana at 3rd Grade Gridiron covered a creamer bottle in colorful washi tapes and the result is a container that can be used for many purposes such as storing hair pins, pencils and other stationary items. 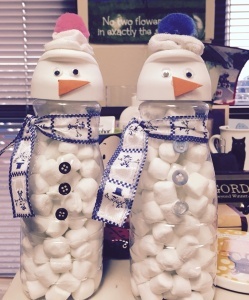 Tami at Tambo’s Creations cut creamer bottles and covered them in scrapbook paper and a fancy trim. 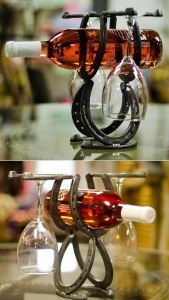 Then she arranged them all inside a wine rack and a lovely pen holder came into existence. 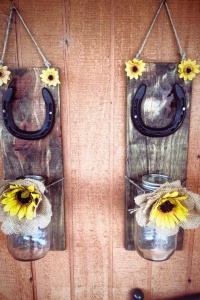 Tammy Klassen at Pinterest has shared an idea for those who love fashion inspired decor. 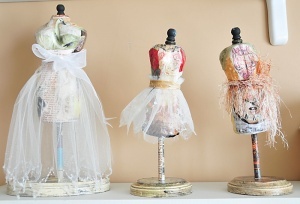 You can create paper mache dresses with creamer bottles. 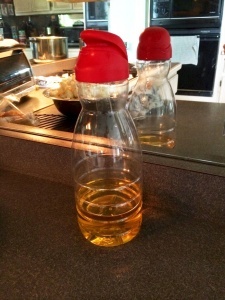 Imari Shah shares a creative way to recycle a creamer bottle into an oil bottle. 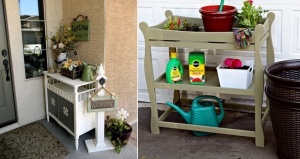 Etsy Shop Orange Hound has come up with a super cute idea you can try for your garden. 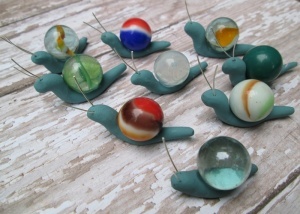 By using polymer clay you can make the body of a snail and top it with a glass marble to mimic a shell. 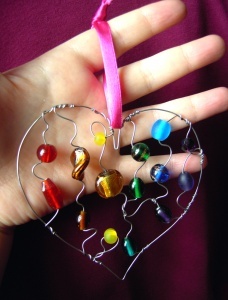 Then make the antennae with metal wires. 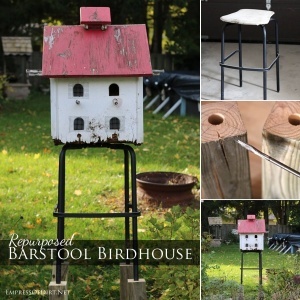 You can make as many as you want and put these critters in different parts of your home’s outdoor area. 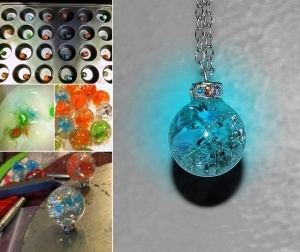 Hopeful Night Owl has shared a super creative way to make pendants out of baked marbles. The term baked marbles means a process of baking marbles in oven for about 20 minutes and then immediately adding them to ice cold water so that they develop cracks internally. Then you can attach caps and rings to string them for making necklaces. 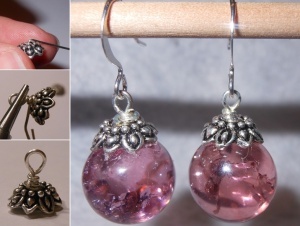 Creative Thriftiness has also shared a tutorial of making earrings from cracked single colored marbles. 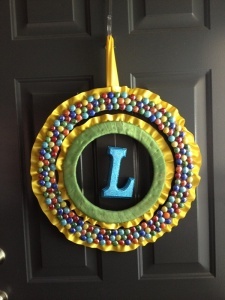 Spring is almost here and if you want to make a wreath for your door then grab the collection of your old marbles and make a wreath like Celia Larimer at Pinterest has shared. 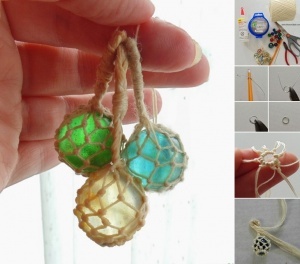 Sharon Ojala at Homemade Obsessions combined the skills of macrame with glass marbles and created these adorably cute miniature glass floats. 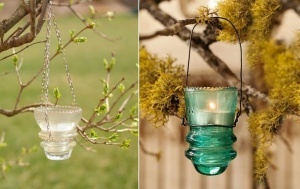 Frou Frugal blog has shared a way to make a candle holder. 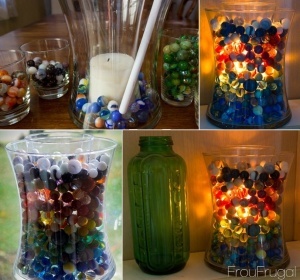 Simply put a votive candle in a vase of bigger size and fill the space between the two with marbles. 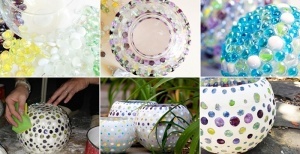 When you will light the candle the marbles will look just heavenly. 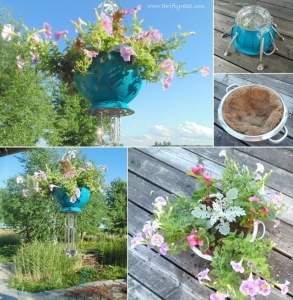 TaDahpdx at Etsy has shared a garden globe idea. 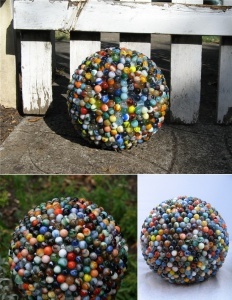 Simply hot glue marbles to an old bowling ball and see what a masterpiece like this will come into existence. 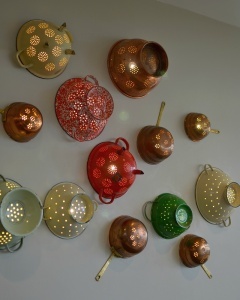 Thoughts on Life, Clay, and Other Stuff Blog has created these sweet mini teapots using glass marbles and metal parts. 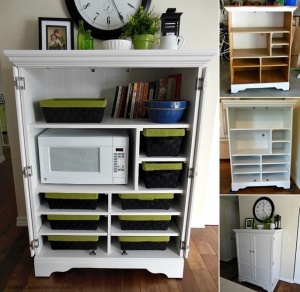 Lori King at Pinterest has shared a wonderful repurposing idea of an old TV cabinet. 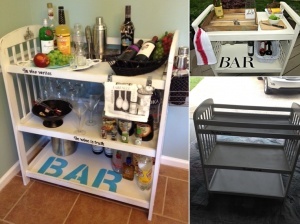 Simply paint it and add a wine glass rack to a shelf and turn it into a wine bar. 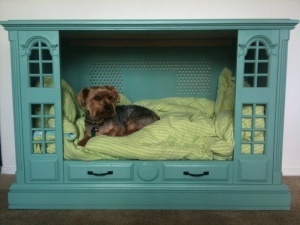 Debbie Williams at eHow has shared a cute creation made from an upcycled TV cabinet. 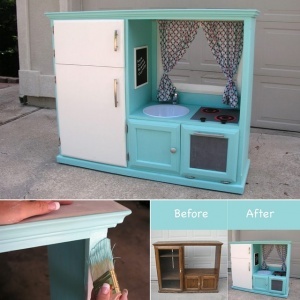 She has painted the TV cabinet in aqua blue and white and after adding necessary hardware she has transformed the old and ugly cabinet into an adorable play kitchen for kids with nonstop fun. 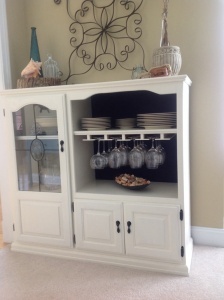 Jann at Newton Custom Interiors spray painted an old orange oak TV cabinet in white and added shelves to it that now serves as a wonderful storage/microwave cabinet in her kitchen. 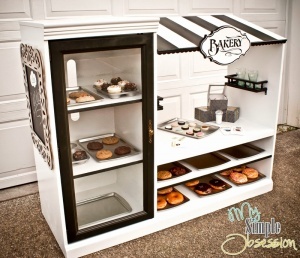 Sarah at My Simple Obsession has transformed an old TV unit into a super cute play bakery. She has added some really fun details to the bakery like cookies made from wooden discs, cake pops made from wooden balls and sprinkles created from seed beads filled in clear salt and pepper shakers. 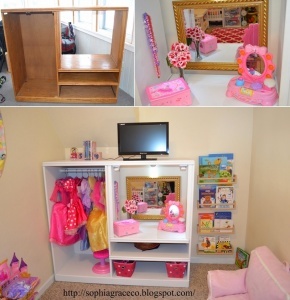 Mariah at Sophia Grace & Co painted an old TV cabinet in white color and then outfitted it with a towel rod for hanging dresses and added a mirror in the TV compartment and now this TV unit lives a new life as a closet that her daughter Sophia can enjoy. Two thumbs up Mariah!